Luxembourg has been one of the most successful and yet the smallest European countries. Being the major hub of the European Union (EU) financial services sphere, as The Bulletin Focus states, Luxembourg is also known for its powerful IT sector. According to The Bulletin Focus, Luxembourg’s contribution to GDP of the EU is 6% and its employment rate is also very high – 6.4m people employed. According to the economic research conducted by Atradius, there are no precise forecasts nowadays, but Luxembourg will surely be a major player in the financial services realignment. IT sector in Luxembourg is quickly growing, as A.T.Kearney report claims. More and more industries engage information technologies and introduce them in their businesses, so IT has all the chances to become one of the most wanted industries in Luxembourg in future. Logically, the report presumes, if one wants to hire developers in Luxembourg, it could be quite a challenge due to the popularity of the profession and high density of IT companies in the country. IT sector in Luxembourg is of high demand, since already existing businesses seek further development and simplification of their business processes. Such industries as media, telecommunication, sales, international trade, finance are heading towards digitalization, where they cannot succeed without the services provided by IT companies. Because of the rising demand for IT services, Luxembourg developers for hire are valuable human resources. We may deduce that these positions are also demanded in Luxembourg as the country is trying to keep pace with the modern tendencies of ICT sector. A dedicated team of developers is a group of IT experts that you hire from an outsourcing or offshore development company (in most cases abroad) for your project. It may include web developers, software engineers, designers, depending on the specifics of your future product. You can hire them by means of outsourcing (project-based model) and outstaffing (dedicated development teams model), this means they will become a part of your project team, but will work as remote employees. According to the report published by Whitelane Research investigating nearly 200 companies, outsourcing activities in Luxembourg are expected to grow. 85% of all respondents of the research said they will continue to outsource, and 51% claimed they plan to outsource even more. 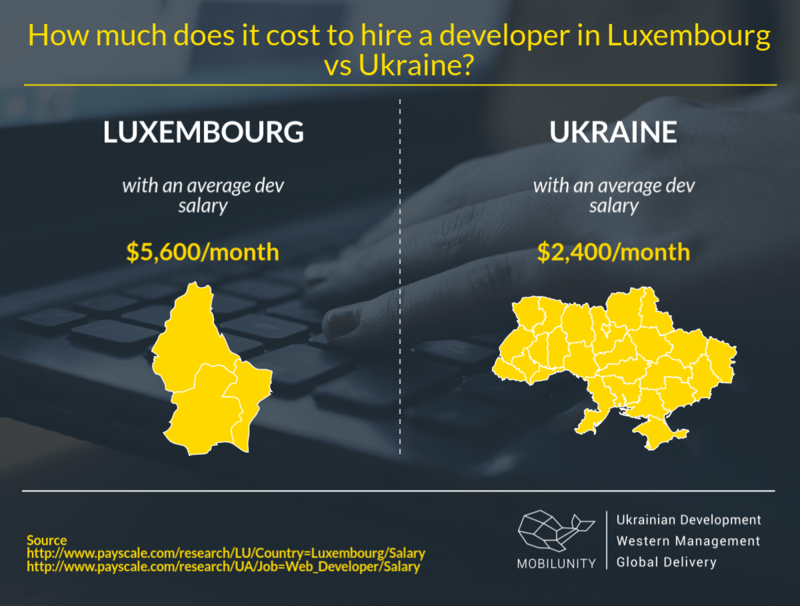 How Much Will It Cost You to Hire Developers in Luxembourg Compared to Ukraine? The main IT cities of the so-called local Silicon Valley, that any Luxembourg developer would like to be part of, are such as Mamer, Schiffrange, Dudelange, Esch-sur-Alzette. The biggest IT companies in the country are located in or nearby Luxembourg City itself. If you plan to hire a Luxembourg dedicated team, be ready for great expenditures. PayScale states that annual wage of a software developer in Luxembourg is $67,466 (€57,000), while senior software developer earns $78,704 (€66,495). In Ukraine, according to PayScale, average payment of a web developer is $27,500 per year, PHP developer receives $22,200 per year, frontend developer gets $21,400, and Java developer is paid $23,600 per year. Just before you make a call to any of the Luxembourg IT companies, make sure you drop us a line. We will quickly analyze your business inquiry and prepare a special offer for you. It will match all your business needs in terms of outstaffing or outsourcing of a skilled dedicated dev team from Ukraine. Our dedicated development teams will not only fulfil your project in due time, but will make the financial load for your wallet not that dramatic. Contact Mobilunity today to find out more about hiring a dedicated team of developers!